There's an added benefit to using gum. Beyond the fact that gum is convenient to use and creates a sustained xylitol exposure, the act of chewing something (most anything really, not only gum) creates an anti-cavity effect on its own. We performed a web search in an attempt to identify some of the higher-quality brands of chewing gum that are available. We found good and bad products. Those whose goal is to produce top-quality effective items. And those who skimp on xylitol content yet are still eager to boast that their product does indeed contain it. Look for gum products that provide 1 gram or more of xylitol per serving. Even some of the better products we found had poor labeling. We were surprised to find that some manufacturers of high-content products seemed to feel that documenting this fact on their gum's packaging was not important. We wonder, how can a manufacturer who has gone to the trouble of creating a decent quality product not understand that a person needs to be able to judge their per-day xylitol consumption in order to create an optimal anti-cavity effect? Oh well. Some of the best xylitol gums we found. Most of the better chewing gum products seem to deliver about one gram of xylitol per piece. Be careful when comparing the labeling found on different products. Xylitol content is often stated in terms of "grams per serving." In the case of chewing gum, you may find that a single serving size is either one or possibly two pieces of gum. Picking out the best gums by reading their ingredient list. The graphic below (#1) shows the ingredient list found on a package of gum. #1: Ingredients found in a xylitol chewing gum. With xylitol listed first, it's fairly safe to assume that this brand of gum is a quality product. Just by looking at it, you could guess that this product probably contains a significant amount of xylitol (possibly as much as one gram or so). This assumption comes from the fact that xylitol is listed as this product's primary ingredient and a one-gram-per-stick dosing is common (see our table above). #2: Ingredients in lower quality xylitol chewing gum product. The inclusion of a second sweetener (manitol) in this gum suggests that its xylitol level is comparatively low. In comparison, here's is the ingredient list of a product that we would consider to be somewhat suspect (#2). We base this opinion on the fact that a second type of sugar is listed. Other sweeteners (manitol, sorbitol) are cheaper to use, so some manufacturers will skimp on xylitol content in favor of using these lower-cost alternatives. #3: Ingredients in a suspect xylitol chewing gum product. The fact that this gum lists another sugar (sorbitol) ahead of xylitol suggests that it's a low-quality product. Here's a product (#3) that has an ingredient list that we would consider extremely suspect. Without documentation to the contrary, it seems unlikely that the amount of xylitol found in this product could be considered to be an effective dosing. This opinion is based on the fact that sorbitol (a cheaper sweetener) is the first listed ingredient. Xylitol is a distant third. Thank you for this site - it had everything I wanted to know! What are these sugar alcohols on products such as power bars. They are not listed as part of the total carbohydrates. Presumably this is to sell to people who are on a low or reduced carbohydrate diet. Are they actually carbohydrates? I assume they are typically sorbitol and mantel. Where do sugar alcohols fit in one's overall nutritional needs? I'm not really all that familiar with this type of product, so I looked it up on the web (choosing the brand that had this exact wording in it's name). These items seem to contain high levels of (cavity-casuing) sugars, primarily glucose and fructose. Evidently that's the whole idea. The ones I saw typically listed one of these sugars first in the ingredient list, and really no mention of xylitol at all. In regard to sugar alcohols and dietary needs, I'm not really going to have an answer. You'll notice that suggested levels of xylitol use for the prevention of tooth decay (the topic of this website) are very low. So in regard to dietary needs, it seems that the addition or subtraction of this amount to your daily diet is unlikely to play any significant role. And yes, xylitol (a sugar alcohol) is a type of carbohydrate (a molecule made up of carbon, hydrogen and oxygen). "Pur" is a gum made in Canada which lists 2grams of xylitol per piece. It is carried by Whole Foods but is much more expensive than "Spry". Pur gum is also found at Bulk Barn in Canada at $1.69 per packet. I did notice that chewing more than 3 tabs resulted in looser BM's. And my problem with dry mouth is worse at night when I need to wake frequently to drink water and then the next step after that. So this isn't the whole solution. Just in case some minor change might help, read this paragraph about side effect solutions. Thank you for the contribution Bonny. We were able to view a photo of the labeling on a Pur package. The 2 grams amount refers to the content of a serving of two individual pieces of gum. Since our table above is organized on a per-piece basis, we've listed Pur there as having 1 gram xylitol content. To be fair to Pur, we saw online sources that had Pur and Spry priced similarly on a per-piece basis. And considering that Pur has 1 gr xylitol content per piece and Spry only .72 gr, it seems the better deal. We do realize that the pricing we see online may be entirely different than what you are able to find locally in your own store. other ingredients in good gums,,'natural flavors'?? Any research on what 'natural flavors' means in a lot of the gums with xylitol? Also, titanium dioxide is in some of the brands and according to Dr. Mercola: Titanium dioxide is often used as a whitening agent in chewing gum, but it's been linked to autoimmune disorders, asthma, and Crohn's disease and is potentially carcinogenic – especially in its nanoparticle form. We don't have any specific additional information to share. Getting xylitol dosings via chewing gum can make a good choice because: 1) The exposure is created over a prolonged period of time and 2) The act of chewing gum stimulates the flow a saliva (which has its own anti-cavity effect). But just sprinkling granular xylitol on and in foods and beverages can create a similar effect, and by doing so you don't have to introduce any new compounds into your diet. So for those concerned, that might make the best approach. I watched a program on TV featuring the benefits of xylitol. It showed children in finland freely taking a piece of chewing gum covered in a xylitol substance to clean their mouths from bacteria after a meal at school. the program was extoling the virtues of including xylitol in your diet. It's nice to hear that people are taking effort to spread the word. By the way, Finland was the country where the anti-cavity benefits of xylitol use were first discovered and researched. sorbitol gum also reduced plaque index and had a superior effect on gingival health. What would the effect of chewing some Pur brand xylitol gum before bed, without brushing teeth, be? 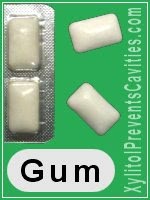 Would this gum prevent any decay that would otherwise begin? Thanks for any help you can give me. Your mouth's exposure to xylitol must meet a daily minimum level for it to be effective. If the stick of gum you mention is one dosing that helps you reach that level each day, then chewing before bed would be a good plan. If you just plan on chewing one stick of gum a day, you can't really expect to generate any anti-cavity effect from just that single low level of xylitol exposure. Not brushing your teeth (with the assumption that the xylitol will be enough to prevent cavities? ), especially before bed, seems an exceptionally poor idea. Oh yes, I do always brush and floss them before bed. I wasn't clear. I just wondered if the Xylitol gum itself - after brushing my teeth - is safe? I didn't realize the gum actually generates an anti-cavity effect. Neat! So, if I understand you correctly, chewing the gum before bed is actually a good thing? Thank you. Xylitol is a naturally occuring compound, both found in many of the foods we eat and created by our own bodies. As a stand alone source of xylitol, the dosing level obtained from a once-daily single stick of gum at bed time would provide essentially no benefit. If consuming that single stick of gum was just one of a person's several-times-a-day exposure to xylitol (so all together the person receives the minimum amount of xylitol exposure needed each day for it to be effective), then that habit would be beneficial. We'd have faith that the molecule xylitol is able to perform the same function in regard to tooth decay reduction no matter what its original source or method of manufacture. This website is about the use of xylitol for the prevention of tooth decay. For us to comment on other uses, or about other conditions, would be beyond the scope of this website. Why are xylitol products, especially gum, not more readily available and why is it so expensive in the United States? The Scandinavian countries have xylitol products of every stripe and flavor, and cost the same as regular gum. They are available at every corner shop, gas station, and supermarket. What makes it so precious and rare here? We agree with you, and don't have an explanation. Please be aware that xylitol is toxic for dogs. Even a few pieces of Trident gum taken out of someone's purse can cause life threatening toxicity. This occurs because xylitol may not be completely digested in the intestines until the digestive system adapts. Xylitol is extremely toxic to dogs. Even small amounts of xylitol can cause hypoglycemia (low blood sugar), seizures, liver failure or even death in dogs. Your precaution always bears repeating, especially for a family loved one. Here's our link to the FDA's warning on the subject. I notice it is not on your list. How much xylitol is in each stick? Is there a mainstream brand (easy to find don't have to order) that would be the best source of xylitol? We looked at the ingredient list on the Trident product. It lists Sorbitol first and Xylitol third (see how to read an ingredient lists lower on this page), suggesting that this is a low-quality product (has comparatively low xylitol content). That would explain why the company has not chosen to to make it clear on the packaging how much xylitol the gum actually contains. That's why we don't list it on this page and as you suggest, we feel there are much better choices. The Epic website has a store locator. We used it and, for example, found a local natural foods store that had it in stock in our area. We can say the same for the Branam website. Probably other brands have store locators too. With a little effort, we'd expect that you'd find some local options. Also don't overlook Spry gum at Walmart that can be shipped to your local store for free. Possibly other chain stores in your area offer that type of service. Xylitol is toxic to dogs! I use Zellies and currently have a bottle with me and it is 1.35 grams per serving which is 1 piece. So the information you have needs to be corrected. Thanks for posting. We appreciate anyone helping us keep our information up to date. In this case however ... we're looking at a picture of the ingredients label for the "100 count chewing gum" jar, as shown on the company's website (right now, today). It states that each piece weighs 1.35 grams total but also states that the xylitol content of each piece is 1 gram (the weight number that has any importance in regard to cavity prevention). That is the number we report in our table above. That 1 gram number is also confirmed by text on the same company website page. We wouldn't have thought that something like that would cause confusion for a consumer. But for others, beware, and look for the actual xylitol content the gum contains, not its total weight. What is the recommended dose of xylitol per day?? assuming that you are brushing and flossing also. Is there a limit? This is our page that discusses xylitol dosing. It and the pages it links to will answer your questions. Is there any xylitol gum sourced from birch? I have an allergy to corn. We found at least one granular xylitol product that said it was sourced from birch trees. What we saw was available from multiple online sources, with one nationwide retailer even offering order online with free "ship to store." If you're interested in using xylitol to prevent cavities and do have an allergy to corn, it seems your persuit would be easiest if you would consider a granular approach rather than relying on commercially prepared products. We also found one birch xylitol chewing gum (search - "birch" xylitol gum). However, it wasn't so clear to us how much xylitol each piece contained, which left us wondering how good that product really is.